Rain washed away the game on April 21, 2000, and Jason Varitek retreated from Fenway's wet playing field to the dugout. A rainbow rose above Fenway as the Braves and Red Sox played on July 7, 2000. Carlton Fisk shows off his newly retired No. 27 to fans on Sept. 4, 2000. Mike McNealy washed windows in the 600 Club as Fenway Park was prepared for Opening Day in 2001. Fans cheered on Pedro Martinez during his April 8, 2001, start against the Devil Rays. Patriotism dotted Fenway Park as the Red Sox returned from a week-long hiatus after the Sept. 11 attacks on Sept. 18, 2001. Teammates rejoiced with Derek Lowe, center, after he completed his no-hitter against the Devil Rays on April 27, 2002. Johnny Pesky, left, led the Red Sox in tribute to his former teammate, Ted Williams, on July 5, 2002, after the slugger's death. A light shone on Ted Williams' jersey hung on the center field wall during the Red Sox' tribute to him on July 22, 2002. Ray Charles sang "America the Beautiful" for Opening Day ceremonies in 2003. Astros outfielder Richard Hidalgo lost Trot Nixon's ball in the bright Fenway sun on June 15, 2003. 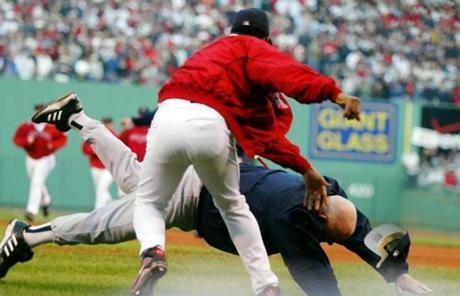 Pedro Martinez knocked Yankees coach Don Zimmer to the ground when the Red Sox and Yankees engaged in a benches-clearing incident during Game 3 of the 2003 ALCS. Ted Williams' daughter, Claudia, got emotional at the unveiling of a statue in her father's likeness outside Fenway Park on April 16, 2004. Jason Varitek struck Alex Rodriguez to spark a benches-clearing incident in a July 24, 2004, game. David Ortiz hit a walkoff home run to close out a sweep of the Angels in Game 3 of the 2004 ALDS. Dave Roberts slid into second just ahead of the throw with the stolen base that was key to the Red Sox' comeback in Game 4 of the 2004 ALCS. A fan held up a "Boston believes" sign during a David Ortiz home run in Game 5 of the 2004 ALCS, the second win of the Red Sox' four-game comeback against the Yankees. Ortiz clutched the championship trophy as the Red Sox rolled along the parade route in celebration of their 2004 World Series title. War veterans carried the World Series trophy and rings onto the field on Opening Day in 2005, as the Red Sox celebrated their first championship in 86 years. Red Sox owners bestowed a World Series ring on Johnny Pesky, who celebrated a title for the first time since joining the Red Sox in 1942. The Red Sox raised the championship banner high on the center field flagpole. Yankees right fielder Gary Sheffield, left, was led away after an incident with a fan on April 14, 2005. Manny Ramirez emerged from the wall with a "Manny being Manny" sign on Aug. 2, 2005, days after the trading deadline passed without him being dealt. 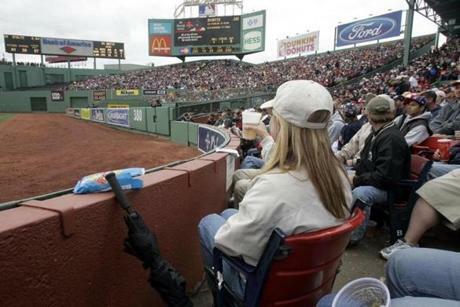 In this 2005 game, Carmen Roberts sat in a right-field seat that faces the bleachers. 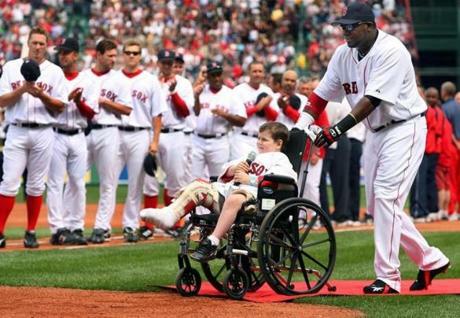 David Ortiz helped Jimmy Fund patient Jordan Leandre, 5, to the plate, where he sang the national anthem on Opening Day in 2006. The Red Sox celebrated Johnny Pesky's 87th birthday on Sept. 27, 2006. The Red Sox hung the Celtics' championship banners from the left field wall as they honored late Celtics president Red Auerbach on April 12, 2007. Christian Elias, right, and Nate Moulter monitored the May 11, 2007, game from inside the Green Monster, where they operated the scoreboard. Red Sox announcer Jerry Remy danced to an air guitar inside the TV booth in June 2007. Red Sox legend Bobby Doerr saluted the Fenway crowd during a ceremony in his honor on Aug. 1, 2007. Clay Buchholz fired a no-hitter against the Orioles on Sept. 1, 2007. Laura Moberg reached for a ball thrown up to her by Red Sox catcher Doug Mirabelli before a 2007 game. Rae Lunam, a vendor at Stand 7, took a break to watch part of Yankees-Red Sox game on Sept. 16, 2007. Jonathan Papelbon ran out to congratulate Manny Ramirez after his game-ending home run in Game 2 of the 2007 ALDS against the Angels. Fans lined up on Yawkey Way to enter Game 2 of the ALCS against Indians on Oct. 13, 2007. Manny Ramirez went to the ground to rob Asdrubal Cabrera of a hit during the 2007 ALCS. J.D. Drew, right, celebrated after belting a grand slam against the Indians in Game 6 of the 2007 ALCS. Jonathan Papelbon danced on the Fenway Park field after defeated the Indians in the 2007 ALCS. At the 2008 home opener, the Red Sox unveiled a championship banner for the second time in four years. The Red Sox welcomed Bill Buckner back to Fenway Park for the 2008 home opener. He threw out the first pitch. Jon Lester acknowledged the fans after throwing a no-hitter against the Royals on May 19, 2008. 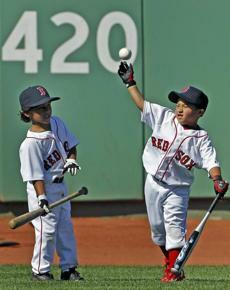 Wally the Green Monster hung out with Weston Taylor, 9, (left) and Mason Taylor 10, of Eagle Mountain, Utah, in 2008. The boys had recently lost their father in a medical helicopter accident. More than 3,000 new citizens were sworn in on Sept. 17, 2008, in the first-ever naturalization ceremony held at Fenway Park. Jason Bay scored the walkoff run when the Red Sox eliminated the Angels in Game 4 of the 2008 ALDS. Sen. Edward M. Kennedy threw out the first pitch to newly elected Hall of Famer Jim Rice at the home opener on April 7, 2009. Bruins legend Bobby Orr emerged from the wall to greet left fielder Jason Bay on June 17, 2009. Zdeno Chara and the Bruins brought hockey to Fenway Park in the NHL's Winter Classic on Jan. 1, 2010. D'Angelo Ortiz (left), son of David Ortiz, and Victor Martinez, son of Red Sox catcher Victor Martinez, patrolled the outfield during batting practice on June 30, 2010. U.S. Army Captain Jesse Bourque saluted during the national anthem on Independence Day 2010 at Fenway Park. Soccer returned to Fenway Park for the first time in more than four decades when Sporting Lisbon and Celtic FC faced off on July 21, 2010. Snow filled Fenway Park on Jan. 27, 2011. Carl Yastrzemski acknowledged the fans after throwing out the first pitch on Opening Day in 2011. The Red Sox wore throwback 1918 uniforms against the Cubs on May 21, 2011. It was the Cubs' first game in Fenway Park since the 1918 World Series. The Bruins showed off the Stanley Cup at Fenway Park on June 19, 2011. 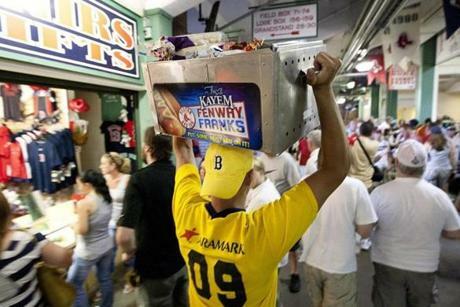 Jose Magrass walked through the concourse while selling Fenway Franks on July 6, 2011. Fenway Park shined brightly as a Boston landmark during this July 27, 2011, game against Kansas City. The multi-colored sunset was visible over the third base stands during this game against the Indians on Aug. 1, 2011. 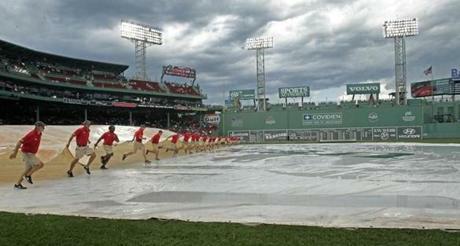 The grounds crew was busy removing the tarp after a rain delay on Aug. 2, 2011. 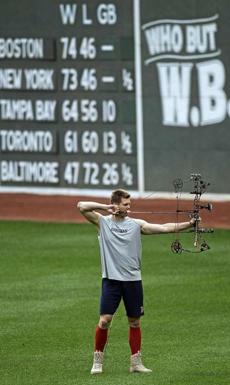 Jonathan Papelbon used the break between games of a doubleheader with the Rays on Aug. 16, 2011, to take some target practice in the outfield. 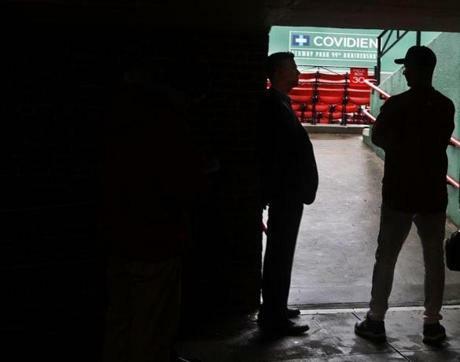 GM Theo Epstein, left, huddled with manager Terry Francona inside the bowels of Fenway Park as the Red Sox struggled through a September 2011 slump during which they would squander a record 9 1/2-game lead and miss the playoffs.